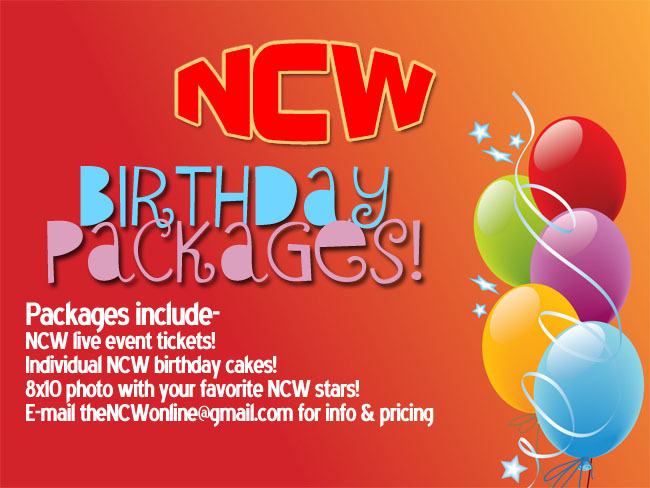 PRESS RELEASE: May 1st NCW’s 18 year REUNION Comes to Norwood! NORWOOD- Northeast Championship Wrestling’s 2015 Season continues on Friday May 1st when we return to our home at the Norwood Lodge of Elks (152 Winslow Avenue) in Norwood, Massachusetts for our 18 year REUNION celebration! Doors open at 7:30 with an 8pm bell time, with tickets available at the door only $10 for adults and $5 for kids twelve and under. If you bring your ticket stub from The Avengers: Age of Ultron (premiering the night before in theaters everywhere) you will also receive $2 off your admission price to REUNION! In the night’s Main Event it will be Champion versus Champion when NCW Heavyweight Champion “RIOT” Kellan Thomas defends his title against the new NCW New England Champion Triplelicious, who still holds physical possession of Kellan’s title belt since stealing it at March Madness. Last month at the Friday Night Fights Trip debuted his newest asset in taking down the champions of NCW when Frank, his 6’6 300lb bodyguard arrived, brutalizing “RIOT”, Commissioner Dean “The Beast” Livsley, and the former New England Champion Rob “The Giant” Araujo. Thomas will have his hands full May 1st as he looks to take back what’s rightfully his. At REUNION two rivals will collide in a huge grudge match when “Ruthless” Ruy Batello goes one on one with his former tag team partner The Lumberjake, as Jake looks to get payback on Batello for a year of hell that all began at the 17 year REUNION last May when Batello turned on Lumberjake. This Season Batello has upped his game against The BFF’s, [allegedly] aligning himself with The Underground Anarchy (“Black Magic” Sean Feeney, “Slamdance” Tim Lennox, and “Bam” Brandon Behm) in his war against Jake and “The Original Showoff” Mike Paiva, leading to a shocking assault at the Friday Night Fights where Feeney launched a fireball into the face of Mike Paiva. Also at REUNION “The Native American” Tomahawk goes into war against “Dastardly” Doug Summers (w/ Ashley Vox) in a Native American Strap Match, NCW Tag Team Champions The Loomis Brothers defend their Tag Team Titles in a Gauntlet for the Gold, plus NCW 2014 Rookie of the Year Christian Casanova, The Heavy Hitters (Champion & Cash), “Sensational” Scott Levesque, “Dynamic” Jon Thornhill, and many more!